The 100 Thing Challenge | A Practical Peacemaker Ponders . . . 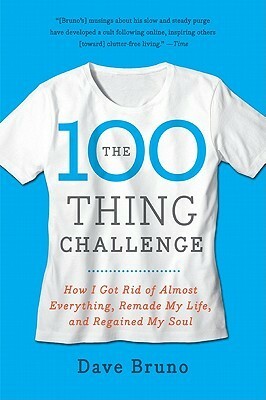 The 100 Thing Challenge: How I Got Rid of Almost Everything, Remade My Life, and Regained My Soul, by Dave Bruno. Harper, 2010. Dave Bruno, a fairly average guy, decides to set himself the challenge of living for a year with only 100 things for his personal use. He spends a year reducing his possessions down to that number, and setting the rules of how he will proceed. I really liked that the guy was thinking and blogging about this, honestly trying to stop buying stuff that leads to clutter and no additional happiness, followed his plan for a year and wrote a book about it. He stopped going to malls and doesn’t own a TV. His wife and three daughters are OK with him doing the challenge although they don’t set themselves the same challenge. By the end of the challenge year, he seems to have changed in ways that will last.